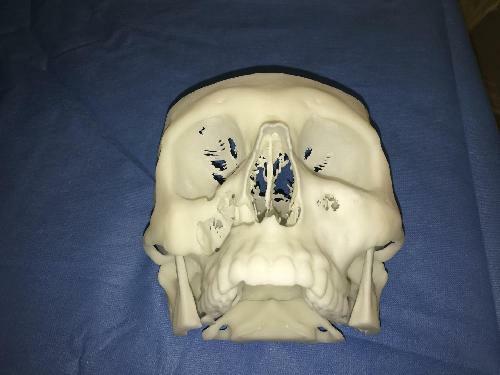 In an eight-hour operation, Dr. Daniel Borsuk, doctor at Hôpital Maisonneuve-Rosemont in Montreal, carried out a facial reconstruction using virtual surgery and 3D models, removing a vascularized piece of pelvic bone and reshaping it to adapt it to the rest of the face before transplanting it through the inside of the mouth. With no scars left at all. In the past, this type of procedure would have necessitated multiple interventions and left one or more scars. "The operation, during which the latest technologies were applied to reconstructive plastic surgery, sends a real message of hope to anyone who feels they must simply live with this type of disfigurement and who often feels so self-conscious that they isolate themselves," explained Dr. Borsuk. For more than 25 years, Hôpital Maisonneuve-Rosemont and the Faculty of Medicine at the Université de Montréal have played a key role in the field of plastic surgery, their professionals working tirelessly to achieve technological advances and make these breakthroughs available to patients. Dr. Borsuk had already participated in a milestone moment in the history of reconstructive surgery when he was the only Canadian physician on an American face transplant team. In 2012, he took part in the most extensive face transplant ever conducted, on a 37-year-old man disfigured by a gunshot wound.